The Summerville model has 2 Beds and 1 Bath. This 900 square foot Double Wide home is available for delivery in Oregon, Washington, Northern California, Northern Idaho. The Summerville offers comfortable manufactured home living at an affordable price. The corner kitchen opens up nicely to the living room and features reliable and modern appliances. 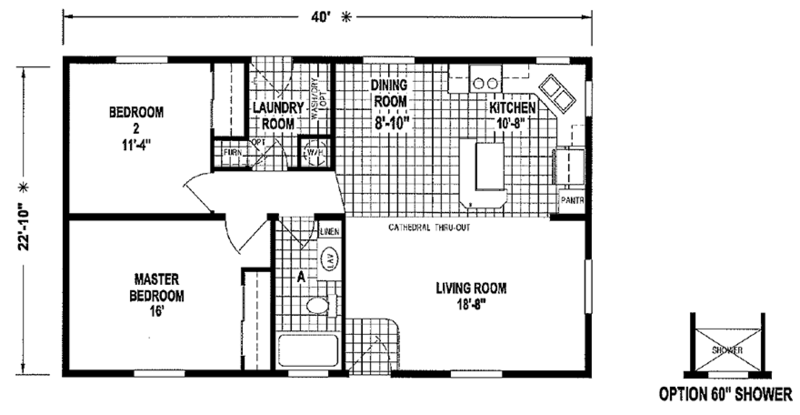 Those looking to create a bit of separation between the common areas and the bedrooms will appreciate this layout. Ask your housing consultant about the other great features that come standard on the Summerville manufactured home.